Coming down the narrow stairs from the loft gives photographers a nice view of the church. It was peaceful inside this space; I felt calm when I left after a happy hour of making photos. 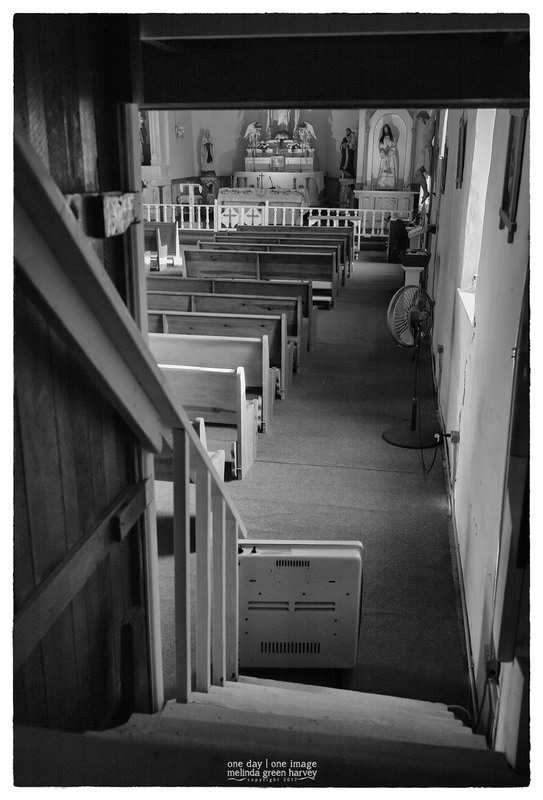 Posted on November 30, 2017, in Photography and tagged 365 photo project, architecture, black and white photography, church, far west texas, learning to see, Leica, melinda green harvey, monochrome, one day one image, photo a day, photography, postaday, road trip, Sacred Heart of Jesus Catholic Church, shafter, shafter texas, texas, thoughtful seeing, travel, travel photography. Bookmark the permalink. 2 Comments. Thanks. I tested the view from several different steps before I got what I was looking for.